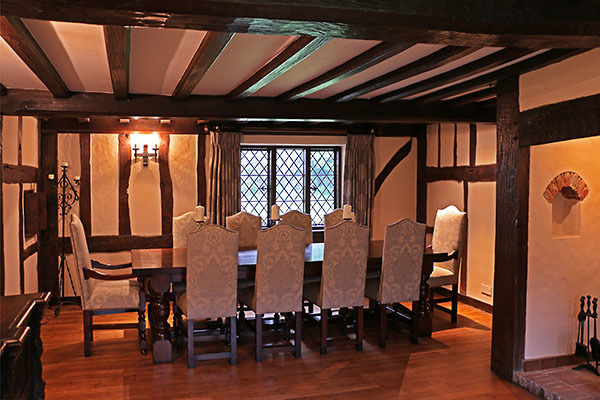 Our Chalvington bespoke range, period style heavy oak table and upholstered side and armchairs, in this beautiful timber framed dining room, of our clients 17th century country house in Sussex. This room, believe it or not, was part of an extension built on to the original cottage, in the Victorian period. 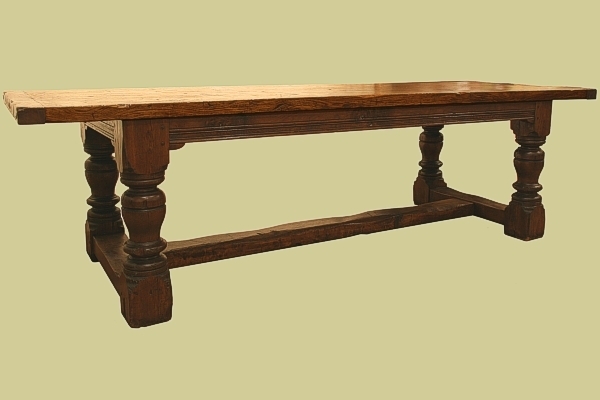 Superbly done, using old timbers, it deserves the very best furniture treatment. As is often the case, these handmade pieces were tailor made for our client. The end overhang of the table top was reduced to allow for the most comfortable chair spacing, given the room width limitations, so the end rails were set inside the legs to give the end sitters more room. The table base was also made to be dismantle-able, to get it through a narrow doorway, and the chair leg turnings designed to compliment that of the table legs.